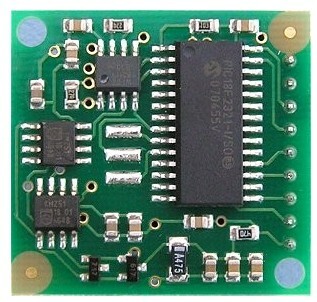 Pin 1, +5v. The compass module requires a 5v power supply at a nominal 25mA. There are two ways of getting the bearing from the module. 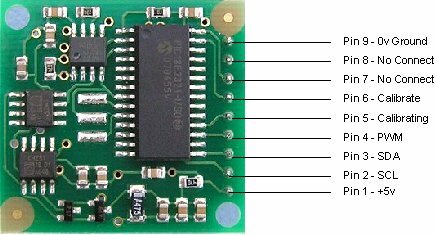 A PWM signal is available on pin 4, or an I2C interface is provided on pins 2,3. Pin 4. The PWM signal is a pulse width modulated signal with the positive width of the pulse representing the angle. The pulse width varies from 1mS (0?/font> ) to 36.99mS (359.9?/font> ) ?in other words 100uS/?/font> with a +1mS offset. The signal goes low for 65mS between pulses, so the cycle time is 65mS + the pulse width - ie. 66ms-102ms. The pulse is generated by a 16 bit timer in the processor giving a 1uS resolution, however I would not recommend measuring this to anything better than 0.1?/font> (10uS). Make sure you connect the I2C pins, SCL and SDA, to the 5v supply if you are using the PWM, as there are no pull-up resistors on these pins.